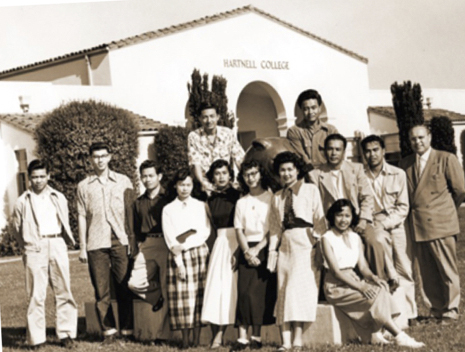 Emil Guillermo: October is Filipino American History Month–get out the birthday suit and celebrate! Once the 15th passes, the confluence of National Hispanic Heritage Month and Filipino American History Month ends, and the Filipinos have October all to themselves. And why stop there? Since there are only 12 months, hcan you blame breast cancer, dyslexia, anti-bully, anti-vaccine, orthodontists, and even pit bulls from wanting a piece of October? Why not, the more the merrier. It’s also ADHD Awareness month. That could be the look of the best overall October poster child, if they were at least half Filipino with a Spanish surname, with another parent of German/ Polish descent. And to top it off, let’s sit down to a meal of that Chinatown specialty roast pork, Filipino lechon. What do you know–it’s National Cholesterol Month. But let’s keep it simple, shall we. From now until the end of Halloween, Filipinos are the pumpkin spice of the tribe. Literally, we’re the Asian American flavor of the month. 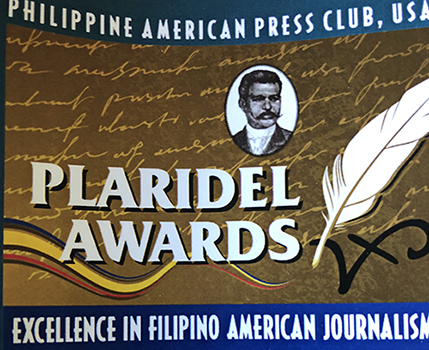 And the month started off with a bang when I won a Plaridel Award for best commentary for a column on the first Filipinos to America that appeared on this blog and in the Philippine ethnic media. Plaridel is the pen name for one Marcelo H. del Pilar, billed as a writer/journalist above lawyer, and known as a Philippine national hero–the father of Filipino journalism–for his passionate writings railing out against the Catholic Church and colonial Spain. Of course, he wrote in a small publication and died a pauper. What an example for the modern ethnic journalist who writes the first draft of history for the community. For this amok columnist, it was an honor to receive the award. And another for Best Radio/Podcast for an interview on the Congressional Gold Medal for Filipino vets of WWII. And all of it so close to my birthday, the self-cancelling Leif Ericsson Day, the day Scandinavians celebrate immigration to the U.S.
That was the subject of my award-winning column and one of the reasons October is Filipino History Month. Filipinos were actually first to step foot on America, Oct. 18, 1587. That’s 33 years before the Pilgrims landed at Plymouth Rock. And they get a holiday. And yes, it was nearly 100 years AFTER Columbus, but he was somewhere in the Bahamas. The Filipino American National Historical Society picked October as the month based on the scholarship of Eloisa Gomez Borah, a librarian who published her analysis of explorer Pedro de Unamuno’s logs in UCLA’s Amerasia Journal. Her article details how Unamuno, sailing for Spain, had at least eight Filipino crew members. It was the Filipinos who led the landing party off the central coast of California in what is now Morro Bay. Of course, the help doesn’t get the glory. And the land was taken for the Spanish. But the Filipinos technically were the first non-indigenous people to step foot on the continental U.S. Being fodder comes with some privilege. Any sliver of mention are points of pride in a whitewashed mainstream history worth savoring. But the day after I got my award, I had lunch with Alex Fabros, a former FANHS trustee and San Francisco State Asian American historian, who has long taken issue with the accuracy of Morro Bay. Unamuno’s landing is solid. The diaries back the dates. But where did he land? My column didn’t question that. But Alex Fabros set me straight. Fabros, 72, is somewhat of an American Filipino renaissance man. He’s a retired military officer, as well as a sailor, and in 2001, he took a class on a boat with the hopes of replicating Unamuno’s voyage. That’s when Fabros noticed something fishy. As he replicated Unamuno’s galleon sail, Fabros was armed with an astrolabe and a sextant in 2001, and noticed that he could be 100 miles off. With the island reference and the error factor, Fabros is almost certain that Unamuno landed in Half Moon Bay, about a three-and-a-half hour drive north of Morro Bay on U.S. 101. Borah mentioned the “crab mentality” of others and stands by her interpretation. But Fabros is no crab. He’s a former adjunct Asian American history professor, who happens to be a decorated veteran, exposed to Agent Orange during the Vietnam War. He’s not interested in a fight. Just the truth. He simply says his replication of Unamuno’s journey shows Morro Bay is just the wrong place for history. Fabros’ challenge goes beyond the first Filipinos. He’ll say unabashedly that it was the Salinas Valley, Steinbeck Country, just north of Monterey, where the Filipinos really fought the violence of discrimination and racism in America. Much more so than Stockton or San Francisco. The Stockton Filipinos were mostly migrants, Fabros said. Hence, the labor contracts would come and go. In Salinas, the workers stayed, so labor contracts were usually hard fought victories that resulted in stronger more lasting contracts, Fabros said. 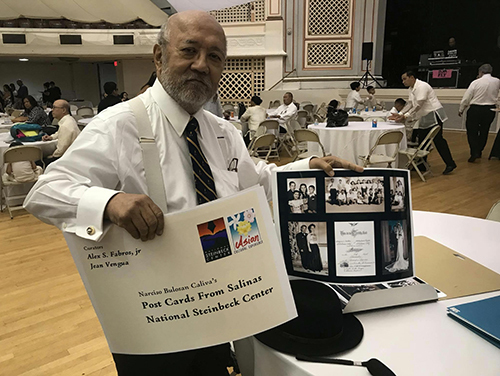 Fabros tells the story of the Central Coast Filipinos in a new curated exhibit, “Postcards from Salinas,” at the National Steinbeck Center’s art and culture gallery. You’ll see the sepia toned photographs Filipinos sent home during the 1920s and ‘30s to let the family know all was well in America. Meanwhile, Filipinos were being violently harassed for consorting with and marrying white women. It led to anti-intermarriage laws that were the emotional subtext of the day. Fabros uses the Caliva family photos in the exhibit. Narciso was a cousin of the legendary Filipino writer Carlos Bulosan. Caliva is seen with his wife, Lucy, in a key photograph. 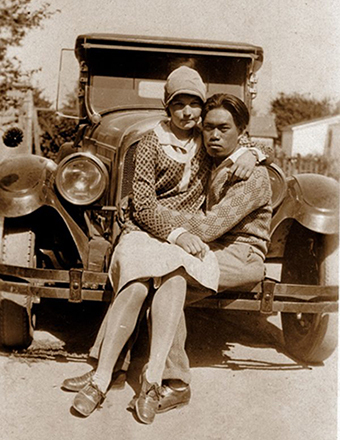 Just the sight of a Filipino man and a white woman was enough to justify rage and anger among white men at the time. If you don’t know Filipino American history, the postcard exhibit in Salinas is a great primer. The evocative photographs are as comprehensive a look at Filipino American life from the 1920s to the 1950s. Along with the FANHS National Museum in Stockton, they’re both worth a visit to Northern California, especially during October, Filipino American History Month.